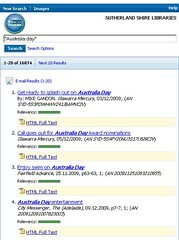 Ebscohost Mobile, originally uploaded by Sutherland Shire Libraries. Ebsco has recently launched a dedicated mobile interface to their popular Ebscohost Databases. This will allow you to search and read magazine, journal and newspaper articles directly on your web enabled mobile phones (including iPhones). The Library subscribes to thousands of magazine, journal and newspaper titles via Ebscohost databases. Years worth of free full text articles in everything from the Sydney Morning Herald to the Australian Journal of Education to Wheels Magazine are available. And you can search for articles by keyword. Got a smartphone? Try it out now. Get started by visiting the Ebsco Mobile site and entering your Library Card number.